Last January, during a sunny weekend day, Kathy and I left the dock at 10 am, and set our sights on the far east side of the Lower Laguna. The tides were extremely low, so we headed up an old drilling channel that provided passage through the thick turtle grass, and emerged onto the vast vegetation-free portion of the LLM in sight of the Padre Island dunes that shimmered in the distance. Turning north, we didn't go far before we spotted silvery "v" wakes of retreating redfish against the surface glare. We shut down, and soon we were out of the Curlew, heading off in different directions toward the blue-tinged tails that were gently breaking the surface of the foot-deep water. Within minutes, we hooked up almost simultaneously on matching 27-inch reds. In the last decade, the Lower Laguna Madre (LLM) has gained recognition as a world-class fly fishery for redfish and trophy speckled trout. But the LLM still has its secrets, and the greatest of these, in my opinion, is the far east side of the estuary, known simply as "the sand." The LLM is about sixty miles long and five miles wide, and is bisected from north to south by the Intracoastal Waterway (ICW). Most bait fishers and blind casting spin fishers gravitate toward several two- to three-foot deep basins adjacent to the ICW. In contrast, sight casting anglers tend to favor shallower and less accessible waters, where thick seagrass provides rich habitat for shrimp, blue crabs, and a variety of fin fish. But about one third of the LLM lies beyond the farthest reach of the seagrass meadows. East of the ICW, the grass runs for about a mile before it ends altogether. Beyond that point, the LLM continues as a sparsely vegetated flat lying adjacent and running parallel to Padre Island, the largest barrier island in the world. At first glance "the sand" seems sterile and devoid of life. Indeed, most anglers who have visited the sand by boat during the lower tides of summer have promptly retreated, not only because the sand looks barren, but because it is critically shallow there, and thus off limits to most boats. Wading the edge of the sand, one can easily discern in the looping prop scars the record of hasty and anxious departures. I cannot recall exactly when I first saw the sand for what it was––an exceedingly fertile and somewhat unique ecosystem that attracts the major species of fish in the LLM. Perhaps it was the moment that my fishing mentor Kenny Barth hooked up on yet another redfish in bootie deep water while I waded fruitlessly in deeper water along the edge of the grass. He would often laugh at me, and say, "You're walking past these fish," but it took me a while to believe it. Today, over 40 years later, Kathy and I prefer the sand to all of the other faces of the "mother lagoon." The sand attracts feeding redfish, trout, sheepshead, ladyfish, and black drum at different times of the year, but there are usually three or four species available at any given time. Redfish. 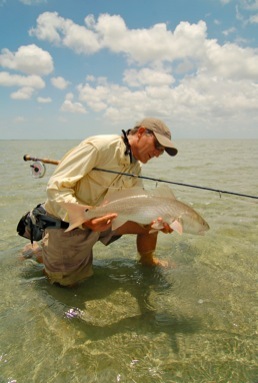 The sand can provide excellent year-round fly fishing for redfish, but it tends to be especially productive during the spring and fall when the tides are higher; during the new and full moons of summer, when increased tidal flow freshens the water on the sand; and during a warming trend in midwinter. Also, the reds move on and off the sand at different times of the day, depending on the time of year. For instance, they will move onto the sand during the spring in the late morning and early afternoon, and typically reach a peak of activity in the mid-afternoon. In contrast, during the summer, the reds and other species tend to gravitate toward the sand during the night and early morning. By midmorning, they will begin streaming off the sand. During this predictable exodus, anglers can stand in one spot and cast to passing fish until they have vacated the premises. The reds may return to the sand during a summer afternoon, especially if there is an incoming tide and a moderate-to-high wind to cool and aerate the water. As for wintertime, large, single reds or small pods may come onto to the sand in the midday and early afternoon as the rapidly warming water temperature of the sand becomes more attractive than the deeper water. Clousers and crab patterns work well year round. Trout. Speckled trout action is usually spotty on the sand, but there are days in April and May where you may see dozens of large trout. Trout usually cruise erratically on the sand, or they may lie very still, appearing dark and lifeless from a distance. I have found trout on the sand especially willing to take a fly, but only if you see the the trout before she sees you, and present the fly unobtrusively. Just the other day, an 18-year-old client stalked an 7-8-lb trout for 15 minutes, presenting his fly several times to the slowly retreating fish without success. He returned to the boat, and announced that the fly was the problem. I pointed out as gently as possible that the big trout probably knew most of his personal history before he made his first cast. As Hewitt once said, "Your fly is not the problem. It's what is on the other end of the line." Believing that can make us better anglers, but to be fair to my young client, a Deceiver or a Mother's Day Fly (my own design and available from Upqua Feather Merchants) might have made a difference. Ladyfish. Ladyfish can be found on the sand in huge numbers almost every day from May through October. 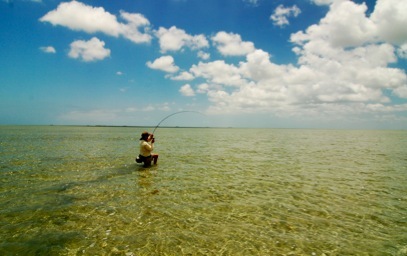 Visiting fly fishers often compare ladyfish to bonefish because of their powerful, blistering runs. While ladyfish rarely get over three pounds inside the LLM, they fight harder than bonefish pound for pound, often breaking heavy tippets on their first run. They hunt in packs, have incredible eyesight, and often come running to intercept a fly from over 15 feet away. When hooked, they fight much like tarpon by running and jumping continually until spent. It is probably true that the sand of the LLM is the best ladyfish venue for fly fishers in the US, in that it permits almost continuous sight casting in shallow, gin-clear water. Small Clousers will get their attention, while attracting reds and trout, as well. Redfish and trout will often travel with ladyfish packs, but will typically lose out to a ladyfish whenever a fly is presented. A fly fisher may, however, fish selectively to the game fish by stripping the fly slowly. Since ladyfish react most favorably to a fast retrieve, they will often give the game fish an opening by nipping halfheartedly at a slower-moving fly. Black Drum. Black drum tend to feed and tail on the sand in schools, especially in the late summer and fall. Acres of black marks in the sand will indicate a recent black drum visitation, and schools will often sweep across the sand from one direction for hours. They are timid and quick to spook, but can be caught on small Clousers and other sparsely dressed bottom hugging flies. As a rule, drum on the sand rarely get more than six or seven pounds. Sheepshead. A member of the porgy family, sheepshead can be found tailing in droves on the sand year round. While they have a reputation for being nearly impossible to catch, they are more willing to take a fly than most people realize. In fact, they will sometimes "turn on" for no apparent reason. They become significantly easier to catch during the winter months. Small, unobtrusive flies––such as a size 6 tan-and-white Clouser––work best to get their attention without offending them. An ideal day on the sand has three components: a southeast wind around 15 mph, full sun, and an absence of white clouds on the horizon. The moderate wind breaks the surface tension, and the full sun and absence of distant clouds completes the conditions for a glare-free sighting window. With this combination of factors, one can easily see fish approaching from 75 yards away. But first one has to locate them. To find the fish, I will head as far east as my Curlew will go––which is shallower than most fish want to be––then turn northwest and slowly angle across the sand until I find the leading edge of the incoming fish. Since the fish are usually approaching from the northwest, I will shut down immediately after spotting a few gamefish, knowing that most of them are probably downwind and approaching. How many fish do you need to see before shutting down? Fewer than you might think. The thing to remember is that the fish will be moving upwind and through you, and should be increasing in number as they move onto the sand. If you manage to position yourself upwind of the incoming fish, the action will increase and may continue for hours. At first, the fish may be spooky and turn away before you can cast to them. However, once they begin to feed, the reds will become distracted by the business at hand. They will begin moving upwind, head down, grubbing in the sand for worms and crabs. Redfish and trout and ladyfish may also begin to feed behind sting rays. In this scenario, the fish will be "cocked and ready" to attack any fly as soon as it hits the water. It is fairly easy to approach actively feeding redfish, either by wading downwind, or by waiting for them to come closer. A fish may remain in one spot before moving upwind and taking up another feeding station. While it feeds in one spot, the angler can slide left or right in order to get into a desirable casting position. Even the stealthiest approach may fail, however, if the fish happens to look up at the wrong time. Because of this, I often advise anglers to get crouch low, and even get on their knees while they are waiting for the fish to come into range. If spotted, it's best to resemble a heron, and to be acting like one, too. Wading the sand is so pleasant that most of my friends and clients opt to wade barefoot on the firm bottom. In so doing, they may wade miles without tiring over the course of six or more hours of fly fishing. Under the right conditions, one can enjoy almost constant sight casting to three or four different species of fish. Fly fishing author and Climax founder Fred Arbona––once said that the sand of the LLM is "the best there is" when the conditions are right. There are a lot of great places to fly fish, and Arbona's words may seem a bit over the top. But if you've ever waded the sand of the Lower Laguna Madre on a sunny day, and felt your heart racing at the sight of an approaching redfish or trophy trout, you might be inclined to agree.